Am I doing this right? 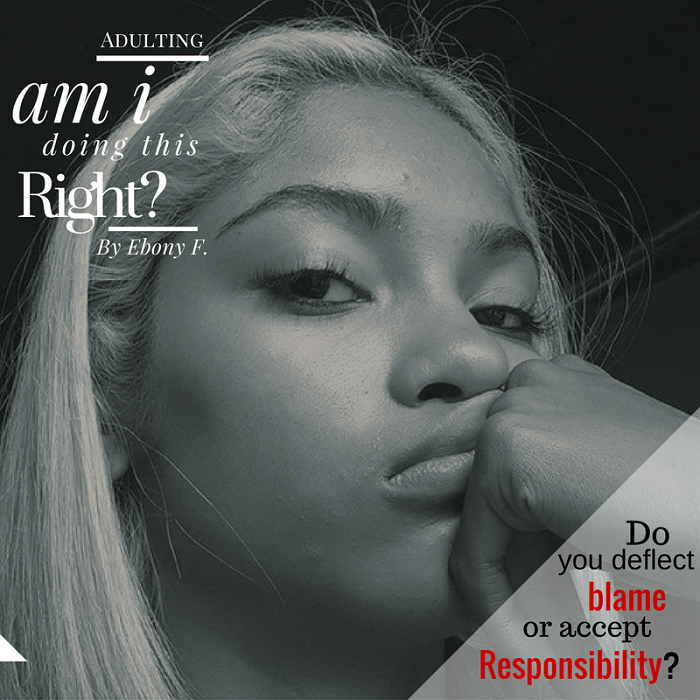 Do you deflect blame or accept responsibility? Photo: weheartit.com Hands down, the most adorable thing I've seen all week was watching a toddler chastise the ground. The child, no more than 2 years old, was walking alongside her mother who was pushing an empty stroller. When the little girl tripped and landed on her hands, I watched as she furrowed her brow and shook her little finger at the sidewalk, saying, "No." Leaning down to pick up her child, the mother affirmed her daughters sentiment, saying, "Bad sidewalk!" Even babies know the instant relief of blame as a defense mechanism. Although adorable in toddlers, this instinctive urge doesn't just disappear as we get older. In fact, if left unchecked, it can become more exaggerated as the stakes get higher. Think about it...What is your first instinct when life trips you up? How do you feel when your boss chastises you for failing to meet a deadline? What is your knee-jerk reaction when called out for doing something wrong? Do you run down the mental list of justifications for why you came up short? Do you shirk ownership completely and cleverly ricochet the blame back on the blamer? Or, do you immediately move to accept responsibility? If you're human, chances are there is a strong temptation to point fingers when things go awry. I've experienced situations, both personal and professional, where solutions have gone neglected as people waste more time searching for a scapegoat than actually resolving issues. I know I'm guilty. Although engaging life in this way certainly alleviates the pressure of accountability, deflecting ownership robs us of the opportunity to evolve. If it's always someone else's fault when you fail, then you have no power over your own success. When it comes to actualizing purpose, there is no more powerful posture than that of accountability. At the end of the day, we can either learn from our missteps, or we can spend our entire lives stunted in a perpetual toddler-like state where it's always the ground's fault when we fall. Want more articles from Ebony F? Sign up for our daily newsletter.